With both of our sets of parents living out of state, and many of our close friends as well, we frequently have guests that stay several nights at a time. Many of them, I dare say, arise earlier than I do, and some even earlier than my husband. So I’ve decided, it’s nice and convenient to have a coffee station with supplies readily available and organized, so everyone can help themselves when the urgent need for coffee arises. 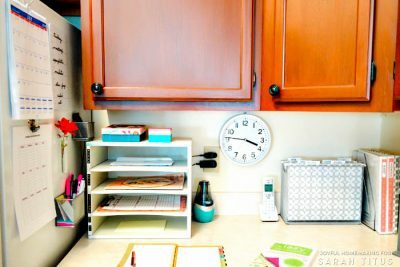 Some people use a pretty or functional piece of furniture for their coffee station, but with my space limitations, an area of kitchen counter is the best space for my supplies. Now there are all kinds of goodies you could stock your coffee station with, but of course, first and foremost is a coffee maker. Mine isn’t anything fancy, and if I’m remembering correctly, I purchased it at a yard sale. For my guest’s convenience, I’ve labeled the top with the water and coffee measurements, so no one has to guess. 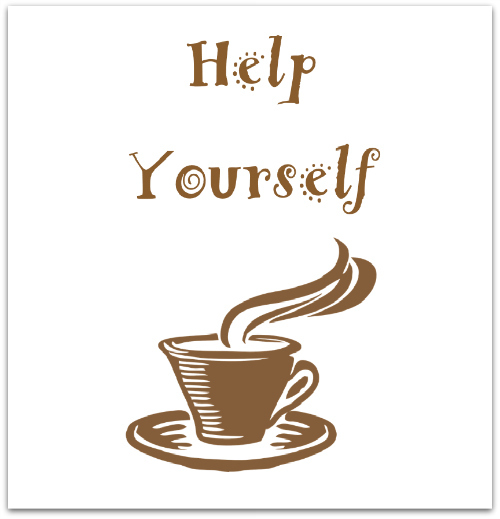 Coffee filters, coffee and water is also needed, and something to measure the coffee (unless your coffee maker makes single servings). My yard-sale coffee maker works just fine for me though, so don’t worry if you don’t have a “special” coffee maker. A good hot cup of coffee is what’s important, not the machine. It doesn’t take much to provide a warm, welcoming cup of coffee, that can make your guests feel at home. 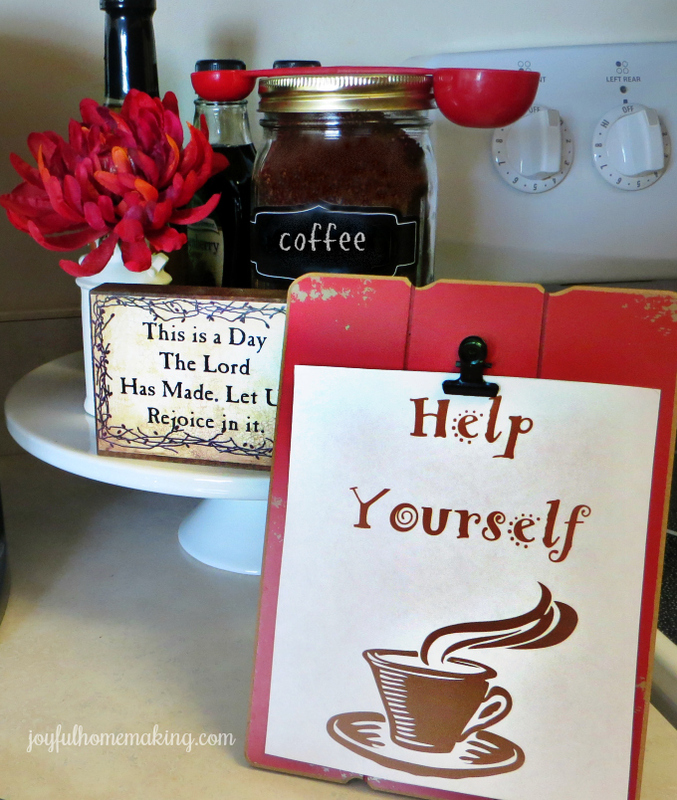 If you’d like, I also made up a welcoming printable to add to your coffee station. Just click on the link or image to open a printable PDF file. 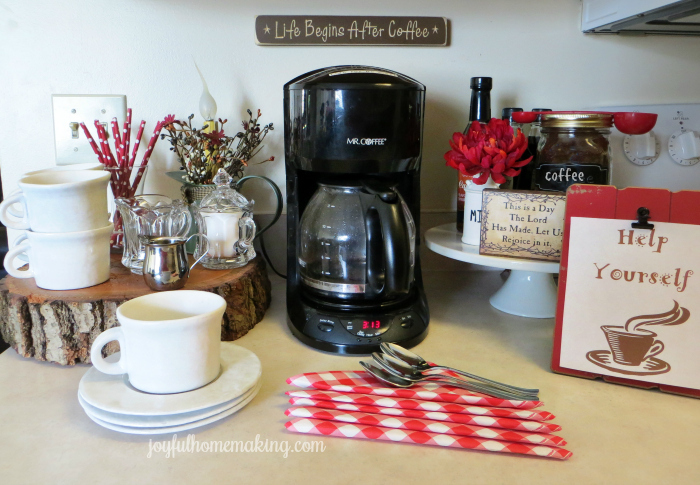 If you need inspiration for fun and delicious goodies to stock up your coffee station with, just check out the coffee aisle at your local grocery, or Amazon online has supplies too! Creamers that don’t need refrigeration are convenient to have on hand, just keep an eye on the expiration dates. Disposable to-go cups can also be fun and convenient. 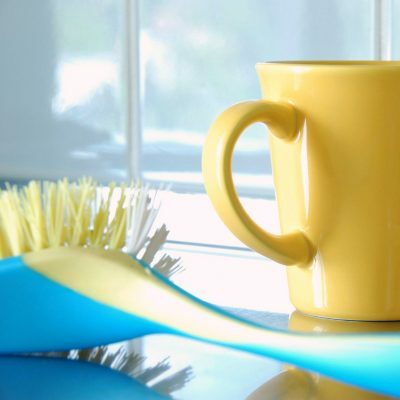 The choice for coffee mugs in different styles is huge, so pick one with your budget and space constraints. 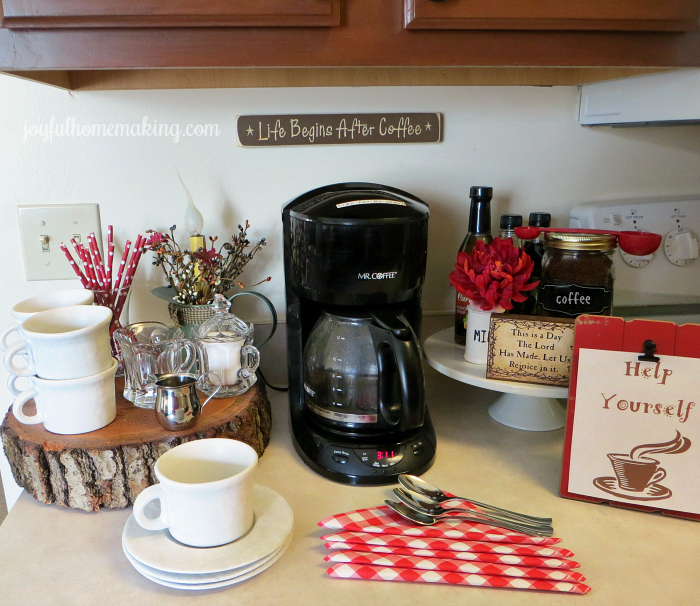 Have fun setting up your own coffee station! That’s on my list of areas to design when we remodel. I really like that mug tree! I do love a good cuppa! 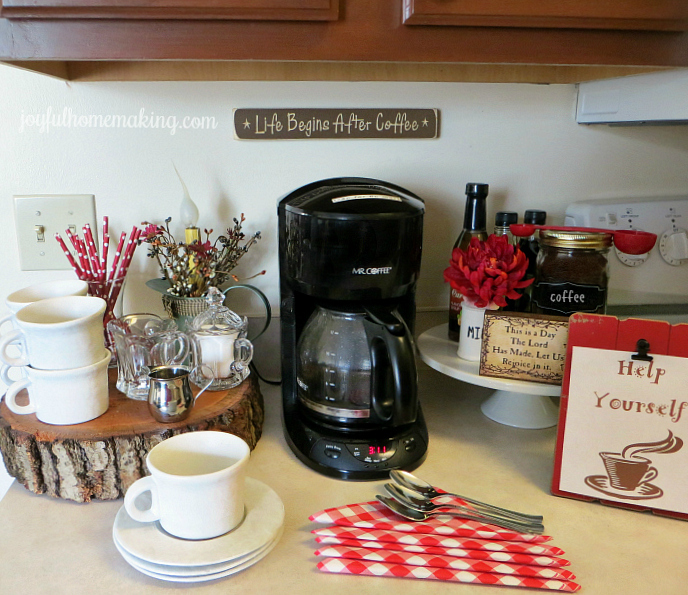 And it makes so much sense to set up a coffee station when I drink and share it so often. Thank you for the ideas, and for the printable – can’t wait to print and frame it! 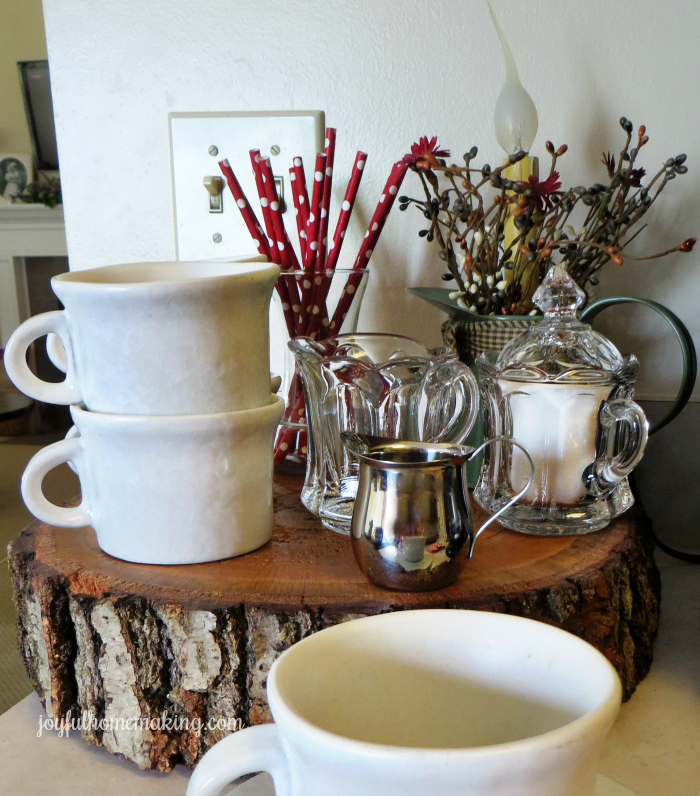 Love the wood tray! I have a little coffee station too, I like to include teabags as well as little breakfast bars or single-serving packs of nuts, etc. That way, my guests can help themselves to a snack without having to dig through my cabinets. Thanks for sharing your station! We are in the process of building and I fully intend on having a coffee station!! Love these ideas! Love this! As avid travellers, we really enjoy staying in Airbnbs and our favourite places all seem to have these little stations. We love making coffee at home, so maybe I need to create a fun station like this, for ourselves! My mother in love has a perfect coffee station in her home. She has left markings on her water pitcher for measurement and a perfect sized scoop for coffee measurement. I’ve always thought it was such a nice setup. We don’t have much guests yet, but my coffee station will come someday. Great post! Cute idea! I want to do this in our house! you’re coffee station is too cute!! I adore the wooden slice as a stand. Love that wood tray! So cute! Thank you! I love it too, and they’re so easy to make! 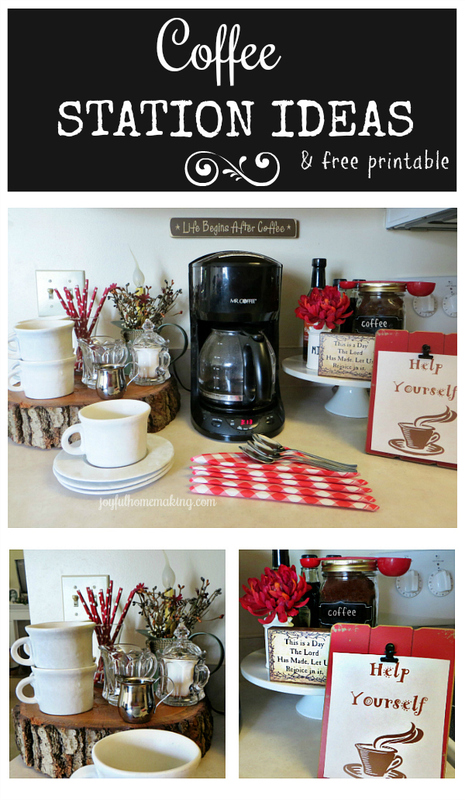 I love coffee…and these ideas! Thank you! 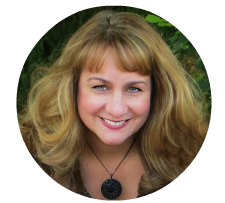 Love your ideas and how you have it set up! I love the cute straws! 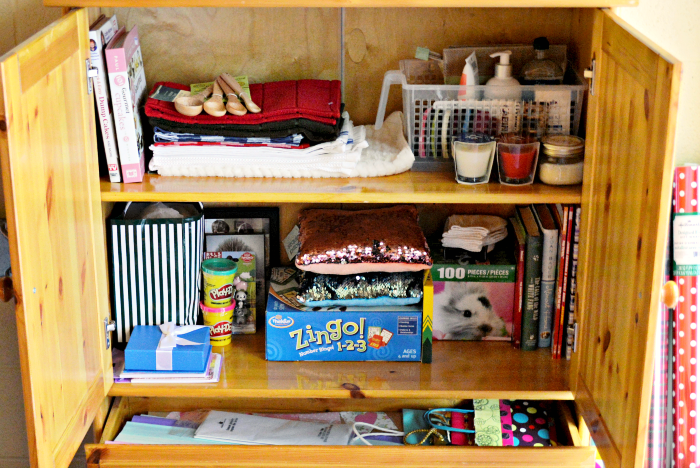 This makes it so much easier when guests come over! This is a cute idea. We have some visitors coming in the next few weeks, so thanks for sharing. Wow, so beautiful! We live in a travel trailer, so our idea of a coffee station is taking up the smallest footprint possible. Obviously, this is out of the running for us, but I enjoyed looking at it! I’ll add it to my mental someday list. Sharing! My dad comes and visits a few times a year and gets up before I do so in my new house I am going to put this together not only for him but hubby who leaves before I do. Along with some snacks they can eat. As for Coffee Pots mine was $12 on Amazon and may not be everyone’s cup of tea but it works for me and didn’t break the bank. Love your beautiful coffee station Margo!